Сергиев Посад-красивейший город,который включен в состав символического Золотого Кольца России благодаря богатому культурному и историческому наследию. It is rare that someone in the Western press writes an article that is more or less balanced. Usually, it is the caricature depiction of Putin as a tyrant, comparison to Stalin or Hitler, a reference to his KGB past, corruption, etc. Words that sound like a mantra, meant to engrain this image in the heads of the Western readers rather than provide a solid political analysis. The editors however realize that not to sound like propaganda, sometimes a more or less balanced articles needs to be presented. Of course, these will not offer an opposite perspective but at least, they will temporary present a balanced perspective, where Russia is still going to be at fault but at a lesser extent. This meant to give the sense of fairness to the analysis but ultimately solidify Russia as the aggressor but with a softer side. Recently, BBC has published a piece by Anatol Lieven on how can the West solve its Ukraine problem. In this article, the author mentions the fact that Russia was heavily subsidizing Ukrainian economy for the past two decades, that the movement towards the EU integration will be disastrous to the Ukrainian industry and that part of Ukrainian forces fighting in Donbass are neo-Nazis. Of course, Putin is shown to be ultimately at fault but at least some of the real problems were also noted in the article. Russia Map — Map of Russia — Russian map — Political map of Russia — Russian Federation Map — Map of Russian Federation showing major cities, regions, seas and other countries. 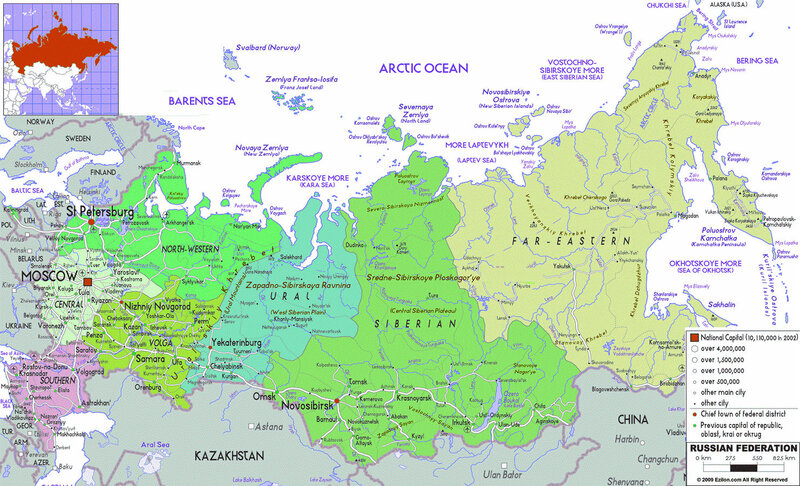 Geographical map of Russia. Russian maps.